The best-selling and award-winning Dear Canada series of historical fiction diaries provide a springboard for exploring different periods in Canadian history. 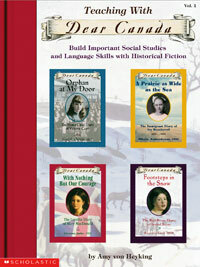 This accessible and informative teaching guide uses the first four titles — Orphan at My Door, A Prairie as Wide as the Sea, Footsteps in the Snow, and With Nothing But Our Courage— to develop children's understanding of historical concepts and build important social studies and language arts skills. Teaching With Dear Canada begins with an overview of teaching social studies through historical fiction and a timeline of Canadian history. 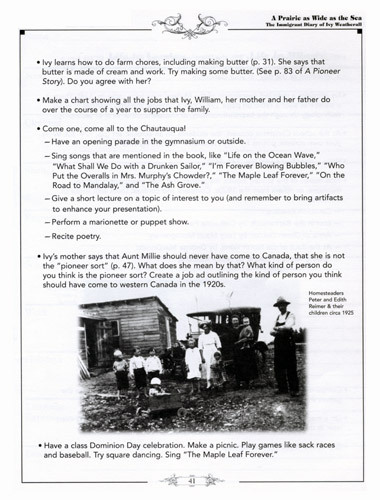 Then, for each of the four Dear Canada novels, the guide provides a summary and themes for classroom discussion. Cross-curricular activities, ready-to-use reproducibles and an extensive bibliography for each book make this guide an invaluable resource for teachers. Using Dear Canada books in the classroom is sure to pique students' interest in our heritage! From Teaching with Dear Canada, Volume 1, copyright © 2002 by Scholastic Canada Ltd.